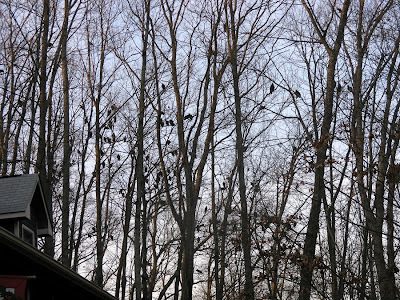 This winter I’ve noticed a large number of large birds perched in the trees near my house in the afternoon (Each of those black spots is a bird). I don’t know what kind of birds they are, but when in flight they look like hawks, with “fingers” on their wing tips. Their bodies aren’t large, but the wingspan is three to four feet, and they have pretty massive tails, and when they perch in the trees, they look huge, because of the large wings and tails. I tried to get close enough to them to get a good close-up photo, but they are 20 feet or so off the ground, and spook pretty easy. I have actually counted more than 80 of them once, about 100 once, and another time I counted 84 with a large group that I hadn’t gotten to when something spooked them and they started flying all over the place. My estimate is that that group numbered more than 120. They don’t roost in our trees, they just perch there for an hour or so in the afternoon, and occasionally some of them leave for a while and return. 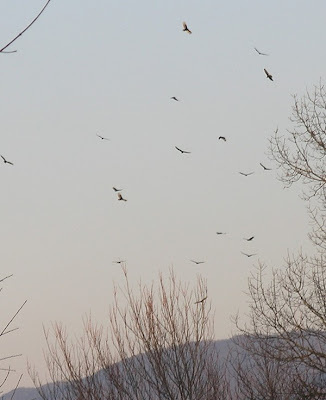 Before they perch, you can see them soaring over the valley. I’ve also seen them in the trees in the morning after it gets light. I’m surprised there’s enough food around in the winter to support them all, but there must be, or they wouldn’t stay around. 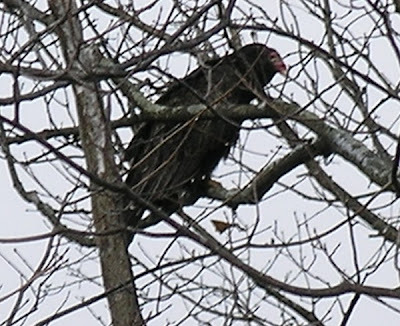 I’m guessing they are turkey buzzards, which is a hawk. Anybody have a clue what they are?